Remember what I said in my Saturday afternoon review about relaxing and picking up bands you missed at SXSW? Sounds like conflicting advice. After you’ve done this festival for a few years, you actually get a weird sense of calm coming over you on the last night. You’ve got this, and you know you’re going to have an amazing time tonight. Your feelings are also tempered by the fact that tomorrow, you’re go home and back, begrudgingly, to Real Life. So you might as well make the most of it, yeah? 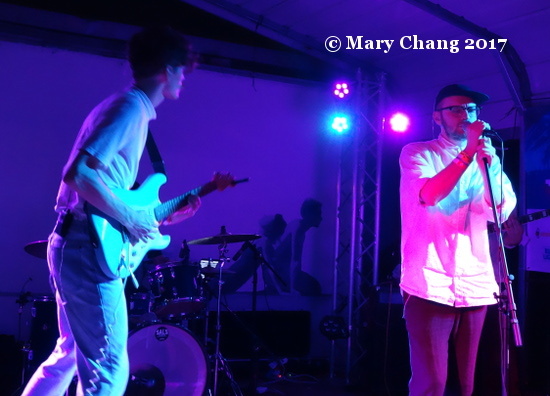 Before I went out to the Latitude 30 for the final time at SXSW 2017, I had a few more bands to experience. I had never spent much time in Swan Dive during past SXSWs, but I can say from this year’s times I really enjoyed both the indoor and patio venues. The staff there were always super nice and eager to get us scanned and into the venue as soon as possible. Was it because the venues are on the smaller side and they weren’t hosting the most hyped bands? Most probably. Still, even though I might not have made this obvious in my mad dash through 70+ bands in my reviews, you can’t and shouldn’t discount the human element in making (or breaking) your time in Austin. While some of the volunteers at the convention center could have used a lot more training (there’s a problem when I know more about the building and what sessions are going on than you do), you must remember that we are guests in this city in the Lone Star State and for a week, they have been our gracious hosts. Every act of kindness, for every smile, for every attempt to keep us safe, all of it: we should be appreciative of everyone’s hard work, time and energy in pulling this thing off. 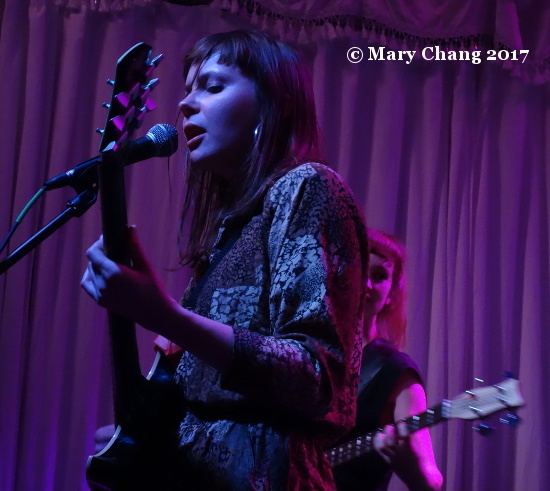 This is what I was thinking when I was watching Berlin girl band GURR (say it with me) play to a packed Swan Dive to start my evening. Happy, peppy pop with the occasional wail of garage rock. Are they sweet or a little bit devilish? That’s the kind of question no-one is going to think about too heavily Saturday at SXSW; all anyone cared about was dancing to the music. If you live in the UK, you’re in luck: they’re embarking on their first-ever headline tour of the Isles with Brighton’s Yonaka later this month through May. They’re also playing Live at Leeds and The Great Escape. Around the corner and down an alley with no queue, and that was all it took for me to witness Swedish alt-poppers Simian Ghost at the Swan Dive Patio. 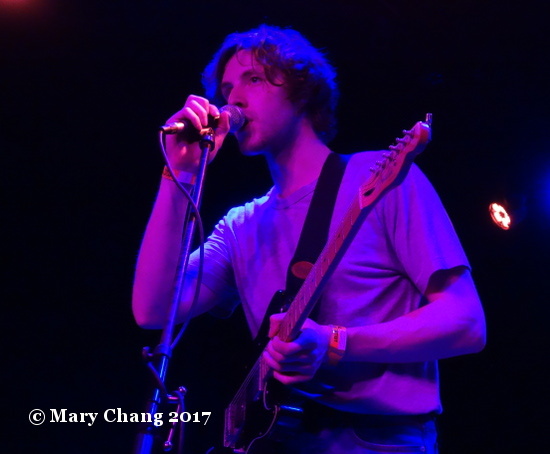 Compared to the much newer acts getting their first close-up in Austin, they’re relative veterans in the music world, and this showed in singer Sebastian Arnström’s relaxed manner onstage, even giving me a thumbs up as I tried to photograph him. Their syncopated new single ‘Stop Moving’ (ironic, that) is out now on Heist or Hit, and it actually sounds brasher than I remembered them. They’ve always had a light touch with their music, keeping things dreamy, echoey. Is it wrong to say they sound so…Scandinavian? A fourth album is purported to be on the way, so we’ll have to see if they plan to diverge from the wistful sound of their past. I ducked into the Sidewinder for the first time ever, and what a cute little place. I could see how this would totally be a cool place to see a band for the first time. Both stages here were showcases being put on by The Burning Ear, whose showcases I had partaked in past years in other venues. I had arrived a little too early for who I wanted to see on the outside stage, so I thought I’d hang around for a few minutes for the act who was performing inside. Here I am, trying to snap a photo of a slight girl with long hair from the side of the stage, and it turns out I’m in the wrong place at the wrong time. 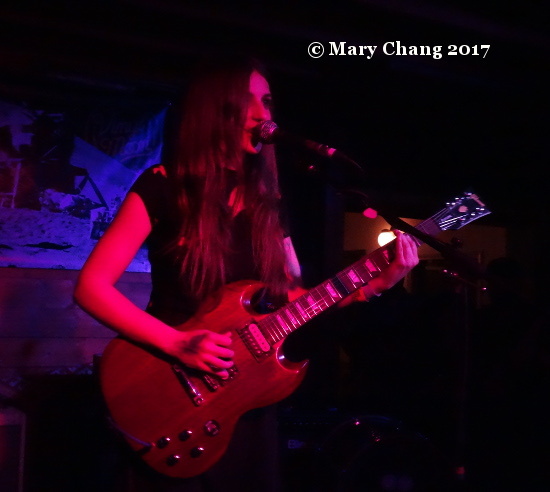 Without warning, GIUNGLA (aka one woman band Ema Drei from Bologna, Italy) leaps out into the crowd, and with her guitar no less. I don’t think the stage crew had any idea she would do this, as I’m the only person who can throw out her lead behind her so she can continue attacking her guitar in the middle of the room. This was the classic case of don’t judge a book by its cover. I’ve no idea how anyone could classify GIUNGLA as pop: she’s a riot grrrl and wants to wail on her guitar, and it just happens that she has a drum machine. According to The Line of Best Fit, she’s signed to London collective Some Kinda Love, so expect to hear more from her soon. It can’t be too hard to imagine that any band out of Norway wishes to match the success of a-ha or better yet, surpass it. The last Norwegian band I thought who would go the distance, Casiokids, received a grant from those highly successful ‘Take on Me’ blokes; the last time I talked to them, they told me their collective had started to fall apart once band members were having kids. Enter Chain Wallet, the Scandinavian pop band of my dreams. Like Casiokids, they are from Bergen, the second largest city in Norway after Oslo. Yes, there are synths. Yes, there are washy guitars. And yes, Stian Iverson’s vocals perfectly match the dreamiest pop imaginable. Give in, because you’re going to get lost in these songs in the end. I recognised ‘Faded Fight’ from their set, which sounded incredible. Just 3 days after I saw them in this back garden in Austin, they were playing with Flyte at London Old Blue Last. Unbelievable. Just remember, you heard about them here first.